The Torre de Bellesguard is one of Gaudí's works that is attached only little importance. For sure without good reason, since you can see several elements in the Bellesguard, that he perfected in his later works. Bellesguard was Gaudí's only work for which he had to search for a building contractor. With this building, Gaudí executed a tribute to the middle age and interpreted the gothic in his own way. NO cancellation or handling fees: you will get the full amount refunded. In case of later cancellation no refund is possible. The particular location of the property in the quiet district Sant Gervasi and the particular history of the house brought Gaudí to buy the property and to build a new house on top of the medieval ruins. The bishop Joan Grau i Vallespinós, Gaudí's good friend, demanded in his will that all the possessions have to be sold and that the income has to benefit the construction of a school. Antoni Gaudí, who used to be commissioned with the construction of the palace Astorga, knew that a building from the episcopalian estate was established on the ruins of a medieval palace from 1408. This palace was founded by Martín I. el Humano, the last king Aragón's. Barcelona's famous Art Nouveau architect, Antoni Gaudí, worked at the Sagrada Familia until his death. Martin I. named the house Bellesguard, catalonian for "beautiful view". He was told about his son's death in this palace. He married his wife Margarita de Prades in the presence of the pope Benedikt XIII and San Vicente Ferrer, to give the royal house a heirs. However the marriage stayed childless until Martín I. 's death on May 31 in 1410, so the catalonian dynasty Trastámara took over the sovereignty. Pope Benedigt XIII. was one of the most important antipope in the time of the Western Schism, the temporary splitting of the roman church, and he was based at the palace Bellesguard for a short period of time. He is not listed on the official list of popes. Although there was barely anything preserved from the gothic palace, the historical importance of the place was an irresistible temptation for the Catalan Gaudí. His interest in the place was so strong, that he became a negotiator between the axecutor of the estate and the buyer: Maria Sagués, a widow whose husband Jaume Figueras was a rich flour merchant and warm admirer Gaudi's, acquired the property and the ruins. The first thing that Gaudí constructed on the property, was a viaduct made from the stones of a wall from the palace laying on the property. A path - which is a street today - led to the cemetery of Sant Gervasi over this viaduct. The viaduct is similar to the ones in Park Güell. 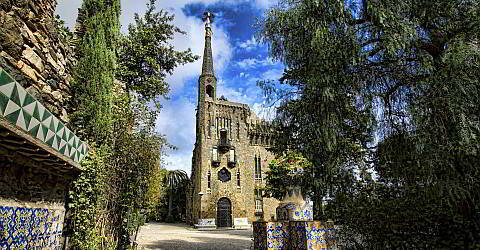 Gaudi was working from 1900 until the completion in 1909 at the Bellesguard. The Torre de Bellesguard is a detached building with a quadratic layout, whose diagonals point at the four cardinal directions. With the house he interpreted the gothic in his own ways in honour of the prosperity of the catalonian gothic: although you can't find as many gothic elements at the building, it still has a gothic appearance. Especially the big portal with its round arch, the longish windows and the with crenellations crowned facade characterise this impression. Gaudí reinterpreted a primary feature of the gothic style: he provided the round arch of the main entrance with six big hexagonal and octagonal tesserae. The texture of the stones is contrastive to the grey-green slates that are used in the remaining parts of the building. By using the slates, which Gaudí found on the property, he succeeded to harmoniously integrate the building into the environment. The inside of the building is contrastive to the dark facade. The building is bright and bathed in light. The bright white of the with gesso and lime paint painted staircase makes the shapes designed by Gaudí gain centre stage. While Gaudí got his inspiration for the facade from the gothic, the inside reminds more of the Moorish and the Mudéjar Architecture, which was characterized by the three big word religions Islam, Judaism and the Christianity. The staircase with its colourful wall tiles and the curved arches give the building the atmosphere of an Andalusian palace. You can divine how impressed Gaudí was by them. Gaudí held the view, that detached buildings have to be equipped with a double roof, in order to insulate the building against the summer heat. The modern insulating materials from today were unknown back then. The lower attic is a large room, which takes up the entire base of the house. The construction of the roof is carried by eight pillars an uncountable number of arches out of brick. The construction looks filigree. "There are things in this house of whom you don't know how they hold", an employe Gaudí's was quoted to have said about the construction. â¨He provided the upper 70qm large attic with an ogival vault, that looks like a cropped pyramid on the outside. There is an observation deck at the top , from which you can experience a wonderful view over Barcelona. Gaudí uses slate as exterior wall of the roof. A gallery leads around the roof, the crenellations form the balustrade. Please indicate the number of the desired tickets. Bellesguard is way less spectacular than many other buildings from the genius architect. It is still worth seeing, the little but really beautiful park invites to stay and enjoy the silence. A visit to Bellesguard helps for sure to understand Gaudí and his development. Bellesguard is a little off the metro lines. Just a few meters from the FGC station "Tibidabo", take the bus 196, which stops in front of the Bellesguard. With the Barcelona Card you have free use of the FGC and the bus. We recommend to schedule about 1 - 1.5 hours for the visit.